Truffles are best when eaten fresh. They tend to dry out and loose their wonderful aroma rather quickly, therefore it is strongly recommended to use them as soon as possible after purchasing; although most of people can’t resist the pleasure of having them for dinner the same day anyway! However, if the truffles are not going to be used immediately, there are methods to preserve their qualities and keep them perfectly enjoyable for one to two weeks. The length of the period during which truffles remain fresh depends on the species, the maturity of the truffle and the presence of larvae. The biggest enemy of truffles during storage is the exposure to ambient air. As a general rule, truffles should not be stored for more than two or three weeks in the fridge and not more than 6 months in the freezer. 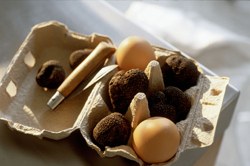 Don’t cut the truffles until you’re ready to use them – they lose aroma rapidly. Lightly rinse the truffles (don’t wash) and completely pat dry them with paper towels. Do not put them in closed or sealed plastic bags: the moisture will make them slimy and can even rot them very quickly. Wrap them individually in a paper towel. Place them in a hermetic container (e.g. mason glass jars.) They must be loosely placed inside the container, in order to allow the air inside to circulate. The container should be placed on the lower shelf of the refrigerator, where it is less cold. This will maintain freshness for about two weeks following harvest. Each day, replace the paper towel with a new one and dry the condensation from the container. To freeze truffles, clean them first following the indications on the bullet below. Next, wrap them tightly in foil (in small quantities) place them in a hermetic plastic container and put them on the freezer. Don’t thaw before using; they will go spongy when thawed. They should be cooked straight from the freezer. When ready to use, brush them using a soft basting brush or mushroom brush, and carefully remove any dirt and mold with the tip of a knife. A good, French traditional way to avoid oxidation is to put the truffles in duck fat inside a glass jar and store at room temperature. They can also be immersed in a light olive or raisin seed oil (or any other oil with a neutral flavor), inside the container the truffles need to be completely covered by oil, and the volume of oil should never be larger than the volume of truffles. The container can be then refrigerated for up to two weeks. After the truffles are used, the wonderfully scented oil will be perfect for another use —a delicate touch in a salad, for example— in the near future. The oil should not be stored for too long. 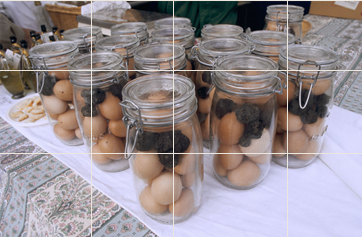 Another great option is to store truffles in a glass jar with hard-cooked eggs for 1 to 2 days in the refrigerator. This will infuse the eggs with the intense aroma of the truffles.